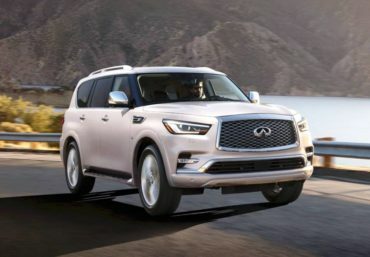 Overview: The Infiniti QX80 is the real deal — a luxurious, full-size, rear-wheel-drive, body-on-frame SUV with available all-wheel drive. 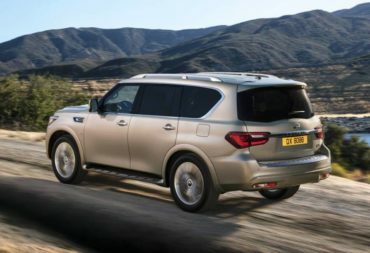 The QX80’s last redesign was for 2011, when it moved from the Nissan Titan platform to the Nissan Patrol SUV. Despite its dated design, it’s still plush and strongly competes against the Range Rover, Cadillac Escalade and Mercedes-Benz GLS. There are no mechanical changes for 2018, just small, evolutionary ones, along with updated sheet metal and cabin colors. Walkaround: The QX80 mixes classic SUV design with a traditional truck-like profile. There’s a slightly sloped windshield, chrome fender vents, slightly flared chrome-trimmed fenders, LED headlights and fog lights, and Infiniti’s prominent signature grille with a huge logo front and center. Interior: The spacious cabin is the highlight of the QX80. It’s as refined and sophisticated as its main competitors and then some. Boasting real burled wood and soft leather, it tailors a polished look with a masculine feel. The front seats are big, luxurious and comfortable. In the rear, despite the vehicle’s size, seating for three passengers on the bench seat is tight. We prefer the two captain’s chairs with the deep-bin center console in our test vehicle. That does reduce seating capacity by one, but the second-row captain’s chairs have available heating and tip forward for easy third-row access. There’s 16.7 cubic feet of cargo space behind the third row and a cavernous 95.1 with both rows down. A power liftgate is standard. Under the Hood: There’s only one powertrain — a 5.6-liter V8 delivering 400 horses and 413 pound-feet of torque. It’s married to a 7-speed automatic transmission and moves the QX80 from 0 to 60 in less than seven seconds. It’s rated to tow up to 8,500 pounds. The available all-wheel-drive is simple, utilizing a low gear ratio. Torque is rear-biased but can go to 50/50 when the rear wheels slip. Behind the Wheel: While 400 horses is less than average for the class, the powerplant is silently smooth and quite strong. Besides our regular weeklong rotation, we drove the QX80 from Atlanta to Gulf Shores, Alabama, and back. Even with the optional 22-inch wheels, the ride was excellent. However, its size makes handling somewhat cumbersome and can make parking awkward. Bottom Line: A fully loaded Infiniti QX80 Limited flirts with six figures in price. But for that, you get a roomy, ultra-plush interior and a smooth highway ride. And on a long trip, it’s definitely the way to travel.